So there I was in the changing rooms in a men’s clothing establishment about to try on a pair of jeans. This is something I have done many times before, usually with great success because I am average in every way – average waist and average regular trouser length. I don’t want to scare you all by getting into too much detail but suffice it to say I had to take off my shoes and trousers in order to try on the new pair (try not to picture me in my shreddies, dear reader – you can’t unsee an image like that). After all, it would be pointless trying to haul a pair of jeans over another pair wouldn’t it? Not even I am stupid enough to do that. The exercise was supposed to be straightforward; I pull on the new jeans, check that they fit my slightly expanding waistline, check that they are not too long or too short and see if they actually look good on me, rather than making me look like an abnormal alien creature. It all sounded too simple – until I actually attempted to get the things on. Being an old coot, I didn’t really check them well enough. There seemed to be an extra dimension – a “fit”. I had heard of things like “boot cut”, “loose”, “straight”, “tapered”, “slim” and “skinny” and I knew my limits. Sadly, a malicious, evil and possibly incompetent buffoon had mixed up the jean “fits”. I can imagine the evil sneaking satanic swine swapping the trousers, putting the “boot cut” on the “tapered” section, the “slim” on the “tapered” section and sniggering as his victim took the wrong pair. The jeans themselves had no warning of what was to come – no sign that said “wear these jeans at your own risk”. I had picked up what I thought were “tapered” jeans. There was no sign to tell me otherwise – only the price tag, the waist size and the leg length. I thought I would slide my leg in easily.I was wrong – horribly wrong. My pushed my foot in expecting an easy slide to the hole at the end of the leg and it got stuck so suddenly that I stumbled and almost overbalanced, hurtling forward towards the curtain before I managed to reach for the wall. Imagine if I had lost my balance completely and fallen out of the room in my underpants? No – please don’t do that. I was so relieved that I managed to lose a little more common sense. I know that new jeans can be a little stiff but I was determined to win. Part of me thought that my leg had grown so thick in my old age that even tapered jeans were a struggle to peel on. Reason gave way to more stupidity. I was overcome by a sense of competitiveness that is unusual for me; I would pull these jeans on if it killed me, if nothing else to prove that I wasn’t just getting bigger in my old age. The denim would slacken as I wore them, I figured. I didn’t consider that I would look ridiculous in tapered jeans that were too tight. I have fairly big calves anyway (I do a lot of walking) and once I had got my foot past further in, I had to apply immense force to peel these bastards onto my leg. I ignored this inner voice of reason and persevered, groaning as I hauled the leg of the jean over my knee and upper thigh. “Are you okay in there?” came a voice from outside. “Yeah,” I said thinking that I sounded nonchalant. I tried the next leg and the struggle was possibly worse. I found myself standing there with a pair of jeans halfway up my upper thighs. With more crazy resolve, I pulled the jeans the rest of the way, somehow managing to slide them over my arse. I looked at myself in the mirror; I was bright red and sweating like a pig that had just run a marathon. I managed to fasten the trousers at the front and button them up – but it was hard, dear reader. I could feel my circulation being cut off and I won’t even describe the feeling around my nether regions. I turned around and I looked like a sack of potatoes perched precariously on two thin branches. At least they weren’t those low slung jeans that don’t cover your underpants; that would have been far worse. There was enough room to walk around a little in the cubicle and I tried, dear reader, I tried. These bloody jeans actually squeaked as I moved and I let out at least two involuntary high-pitched squeaks of my own. The pain of walking around in these satanic jeans focussed my mind. “What the bloody hell are you doing?” I asked myself. With much relief, I sat down to take the things off but in a moment of manic madness I realised I had forgotten to unfasten them. How I didn’t squeal is a miracle to me. I had to stand up again. It took me ten minutes to peel the bastards off – it felt like they had been superglued to my legs. Eventually I got them off and with much relief I put my old ones back on again. I left the changing room, still red with the effort of extricating myself from their clutches and, as I handed them back to the man looking after the changing room, he smiled knowingly. “A bit too skinny for you?” he asked. He looked at me as if I had gone mad. “Can’t you tell?” he asked sniggering. I was so embarrassed that I left the shop in shame. As I wandered around trying to recover from the humiliation and assault by a pair of skinny jeans, I noticed that a few young lads walking around the shopping centre were wearing them. These things had nearly castrated me and here were young 20 year old males with skinny legs walking around in jeans that were around four times too small for them. And I swear, dear reader; every one of them squeaked! I'm glad you managed to get them off without assistance although why you continued your struggle to get them on is beyond me. I've tried jeans in "my" size and found them too small and realised right away the sizing system must have changed, or a girls size 16 must have got put into the womens section by mistake, that happens a lot in second hand stores, not so often in department stores. 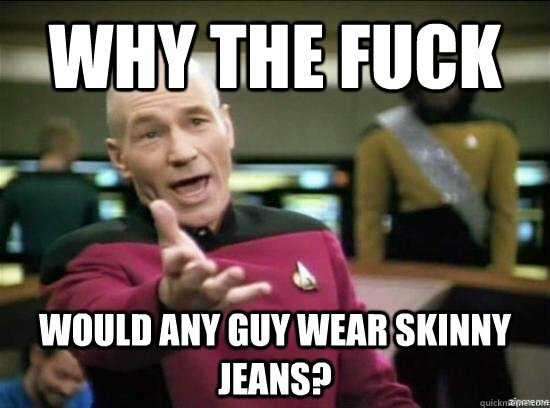 Back to the skinny jeans though, I don't see how anyone can wear them and be comfortable. And if they sit or kneel too long the circulation is severely compromised which is very very bad. I continued my struggle because deep down there is an idiot living within me. My son wears them - no wonder it takes him ages to get ready. Also, I've never understood women's clothes sizes - that would have been a REAL challenge.